Curler Weston Smith (left) points to an opening for a teammate at the other end of the ice during a playoff game in Belfast in 2003. Watching Smith are (from left) Mark Taylor, Jim Pierce and Tom Hansen from Utica. GLENBURN, Maine — Five years ago, Weston “Wes” Smith made history as the oldest competitor at the 2006 Paralylmpic Winter Games in Turin, Italy. Smith, who was 65 at the time and made his mark in the sport of curling despite his physical limitations, died on Monday in Florida. He was 71. Smith was a Glenburn native who worked as an independent living specialist at Alpha One in Bangor before his retirement in 2009. He had used a wheelchair since 1995 due to a tumor on his spine. Gaelen Saucier of Bangor, himself a wheelchair athlete, referred to Smith as a mentor. “He was fairly amazing to me; he introduced me to sled hockey after my injury,” Saucier said Wednesday. Saucier suffered a spinal cord injury after a fall in April 2003. Smith’s spinal cord tumor initially claimed his left leg in 1978, and 17 years later, the same tumor spread to his right leg, relegating him to a wheelchair. But that didn’t slow him down, as he participated in numerous wheelchair sports including tennis and basketball, according to a short biography of him on the Eastern Agency on Aging website. After his retirement, Smith and his wife, Elaine, relocated to Sun City Center, Fla., about 25 miles from Tampa Bay. Even though Saucier’s favorite sport has been sled hockey, Smith was always trying to get him to try curling. “That was his big thing; he was always trying to recruit people for that,” said Saucier. Curling is a sport played on ice in which players slide stones toward a target area. Smith used his position at Alpha One to obtain a Rink Link grant, which introduced people with disabilities to sports such as curling and sled ice hockey. Smith founded the Youth in Motion program, which serves area children with disabilities. When he retired, Mike Noyes, who lost the use of his legs in an accident in 2000, took over the program. Saucier described Smith as a devoted family man who could be combative at times. Smith, who was a member of the Belfast Curling Club, participated in the 2006 Paralylmpics, sitting in his wheelchair while holding his stick in front of him. He used the stick to push a 42-pound granite stone toward the target area. However, in the Paralympics, there aren’t any sweepers, or people who clear the way on the ice for the stone. 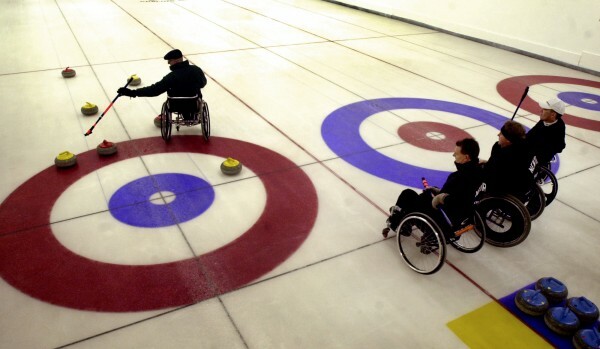 The 2006 Paralympics marked the first year that the sport of curling was held at the games, and it was recognized as an Olympic sport for the first time that year. Smith was also on the EmPower Loan Board under the auspices of the Finance Authority of Maine, which provides disabled people loans who couldn’t otherwise get them to use for equipment such as wheelchairs. In addition to participating in the Paralympics in 2006, in which the U.S. team finished tied for last place, Smith took part in the inaugural Wheelchair Curling World Championships in Switzerland in 2002. Saucier was shocked to learn of Smith’s death. “It was a big hollow spot when he left Bangor, now it’s just gotten a little big bigger,” he said. Smith is survived by his wife, three sons and eight grandchildren.